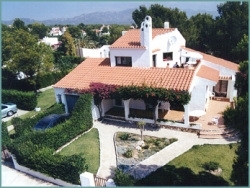 VILLAS AND APARTMENTS TO RENT IN L'AMETLLA DE MAR, SPAIN. Welcome to our selection of holiday homes to rent in L'Ametlla de Mar, Spain. L'Ametlla de Mar is a traditional fishing village close to Tres Cales with narrow winding streets with a good variety of shops, bars and restaurants which serve up local specialities caught straight from the sea. A pleasant place to relax either just walking around the typical Catalan village or sitting on the beach catching the sun. There are a few fiestas during the year including rice and noodle cooking contests with concerts and displays, the Corpus Chris in which locals arrange flowers around the streets of the village in the form of beautifully decorated pictures and the Tortosa Renaissance Festival which features market stalls, entertainers and dancing. Looking for self catering holiday accommodation in L'Ametlla de Mar? Then below is a selection of holiday apartments in L'Ametlla de Mar and holiday villas in L'Ametlla de Mar that can be rented direct from their owners. You can either click on each listing for further details or you can use our search engine on the left if you are looking for something in particular.